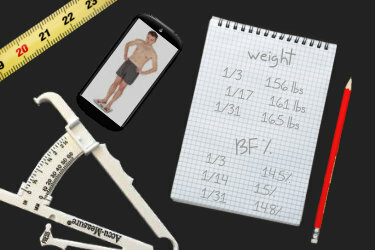 The following calculator will estimate your body fat percentage and lean body mass (LBM) based on skinfold measurements. The calculations are based on Jackson-Pollocks’ formulas for body density and Siri’s formula to get body fat percentage from that (which can be found on the above linked page). See below for a few notes on body-fat estimations. Used properly, your body fat percentage and lean body mass calculations can be the most valuable information you can use to track the effectiveness of your bodybuilding program. This is only a “body fat estimator.” While using skinfold measurements can be the most accurate and practical method of regularly monitoring your body composition, it is only as accurate as those skinfold measurements. Actual numbers can vary wildly based on who takes those measurements and how they take them. Shoot for consistency in your measurements and use your percentage and lean body mass number to guage the effectiveness of your current training and dieting practices. There are many equations for estimating body fat percentage and all will give you somewhat different results. Even if you switch calculators or programs who are using the same equations, you can get some slightly different results due to different programs carrying the decimal points out to different lengths or discrepancies in the equations. Like everything else in the frustrating world of body fat percentages, find one way to get your body fat calculations and stick to that way. Why do the equations include age? By including age the equations attempt to compensate for the fact that as your body ages it begins to lose lean muscle, retain intra-abdominal fat, and lose bone density. These things are not measurable with your body fat calipers. The age compensation included within the equations is based on normal people, not active trainers. Physical activity and especially strength training will negate the age part of the equation. So, if you are in superior shape you will likely get a more accurate body fat percentage by just claiming to be 20 (or 21 if you still want to buy alcohol) when you do your body fat calculations. Sample ways that tracking will benefit the trainer – Exactly why you want to track.